The theme of books I love are ones that break my heart a little. There is heartbreak that come in different forms and for Isabel, it’s a failing marriage, the death of her best friend, her daughter growing up, her family in the Holocaust, and her miscarriages. How can you find happiness in so much heartbreak, especially all at once? I was drawn to Isabel for her dark sense of humor, her sadness and her struggle to find happiness. I laughed more than I expected, I cried and cheered on Isabel. It’s sad, funny and Lauren Fox wrote a book I’ll never forget. Five stars!! I wasn't expecting to love this book so much. It's a YA love story but not the kind of love story you'd read about. Penny's broken relationship with her mom brings out anger and vulnerability. She uses humor to cope and while she prides herself in her independence, there's no denying the need for friendship and love. I loved it and I wanted to give Penny a hug at the end. The only qualm I had with this, if any, is there is a few paragraphs that mention a deceased baby, which is part of Penny's writing project for one of her classes in college. It threw me off a bit but not enough to make me stop reading. If you're sensitive to this, just a warning! Five stars. I need to thank Kristin for this recommendation! I loved this book. It's a geeky YA twist on the classic tale of Cinderella. There's a geeky convention (the ball), a distant step mother, a pumpkin colored food truck, and some sweet and funny moments. I love YA tropes but this one is cute and I'm still thinking about it. This is another YA book I picked up because the author bio said she grew up in Orange County, where I grew up. Shows, musician boyfriends, writing song lyrics in Live Journal, and sneaking out to see bands was my high school age life. Sarah deals with tragedy and within her grief she's trying to maneuver her relationship with her mom (is this another theme I noticed? Mom issues?? Love you mom! I promise there are no issues!) find friends, discover who she is, write music and be a stable teenager. The writing itself was poetic and took me back twenty years ago. I'm looking forward to what Smetana writes next! The best way to describe this comic is weird and beautiful. It's a mix of Goonies, Stranger Things, E.T., but with a full cast of leading girls. It's the 80's, and someone in the future warns you about planes crashing into buildings, a computer chip named Y2K erasing all the data in the world, men shooting massive people at once, people addicted to their phones. It sounds horrific and strange but they are time traveling teens who are saving the world- the past, present and future included. Vaughan is a sci-fi writer best known for writing Ex-Machina. I read all 4 volumes and looking forward to the fifth installment coming in December! I picked up this book because a reviewer mentioned the Shakespeare theory that Sir Francis Bacon actually wrote it (it was never proven but if you're a big Shakespeare fan, the theory is wild and worth a Google search). I came for the Shakespeare but stayed for Elizabeth Smith Friedman, the first woman coder in the early 1900's. She became a coder to beat the Nazi's and save thousands of people in WWII. 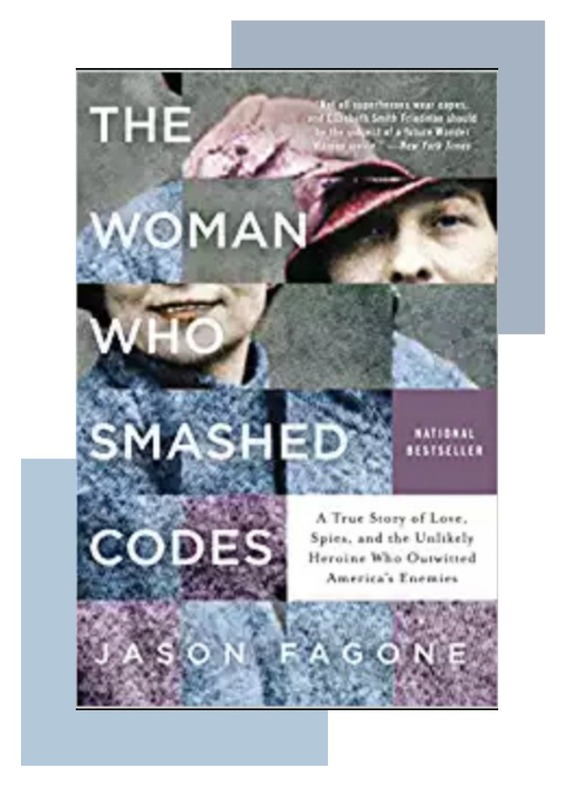 She was married to coder William Friedman who ended up getting most of the credit for her work but thanks to Fagone's research, he was able to uncover the real story. If you're into American history, and coding, it's a great story. Anything I should read next you recommend?